Nefiracetam Benefits And Side Effects | Does Nefiracetam Work? Nefiracetam is a drug that was developed as treatment for Alzheimer's disease, dementia and epilepsy. It is also a nootropic medication since it is able to enhance cognition, learning and memory abilities. The drug Nefiracetam was developed as a treatment for dementia related to Alzheimer's disease and post-stroke vascular disease. Aside from that, the medication has also been known to be useful in antiepileptic therapy. 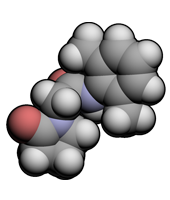 This drug has also been found to possess cognition-enhancing effects and compared to other drugs such as Pramiracetam or Aniracetam, it has had better effects in terms of memory and cognition skills. Users of the Nefiracetam drug have been found to experience anti amnesia effects because of the improvement in their cholinergic, GABAergic and monoaminergic neuronal systems. It has also been used as an anti epilepsy drug and have helped improve cognition and learning abilities. Compared to Pramiracetam, it is able to penetrate into the brain better and thus the effects are longer lasting. It is also known to have a potent effect in stimulating the AMPA receptors in the brain, which have been known to enhance the attention span and alertness. There are not many known side effects that result from the use of Nefiracetam. However, animal studies have shown that large dosages of the drug have reduced testicular testosterone among rats and dogs, it is not known whether or not this drug has the same effect on humans. Nefiracetam works by stimulating a chemical found in the brain called acetylcholine, which is responsible for transmitting messages between nerve cells. Experts believe that patients with Alzheimer's disease experience a deficiency in these brain chemicals. Studies in the use of Nefiracetam have showed a significant improvement in the memory and learning abilities of those suffering from dementia. If you would like more information on which brain power supplements contain this powerful nootropic, check out our product review page!